On Saturday, December 5, the 2015 Annual Clubs Fair at the Recreation Center in Sun City Anthem, Henderson, Nevada, took place. The only picture I have of that event shows me counting on my finger the number of books I had autographed up to that point. In fairness, the photo was taken before the event began. Actually, it turned out to be a successful day for a dozen members of Anthem Authors who sold and autographed copies of their books. This was the first time that I had both Eagle Talons and Bear Claws from The Iron Horse Chronicles available for sale. You will notice that I am also proudly displaying the 2015 Bronze Will Rogers Medallion Award. 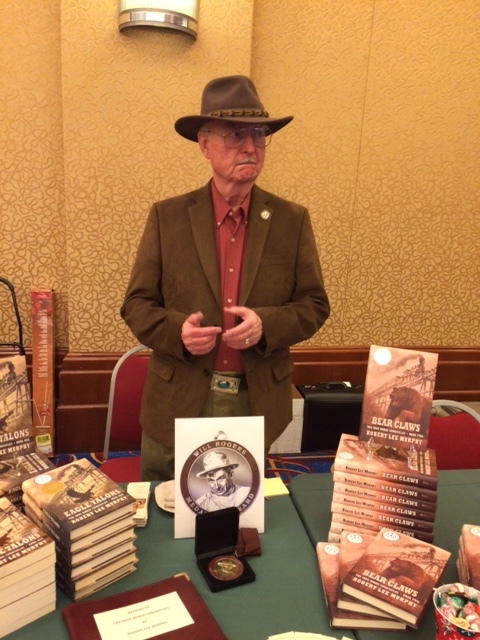 Next Saturday, December 12, 2015, I will be holding a book signing at South Point Casino in Las Vegas during the last day of the National Finals Rodeo. This promises to be a big event. Daughter Elizabeth is coming from California and daughter Anastasia is coming from Kentucky to help. My wife, Barbara, will also be assisting. If you are in the neighborhood, please stop by sometime between noon and 4 pm. This entry was posted in Bear Claws - Book Two, Book Awards, Book Signing, Eagle Talons - Book One, The Iron Horse Chronicles and tagged Adventure Fiction, Bear Claws, Eagle Talons, Frontier Fiction, Historical Fiction, Middle Grade Fiction, Teen Fiction, The Iron Horse Chronicles, Western Fiction, Writers' Associations, Young Readers. Bookmark the permalink.